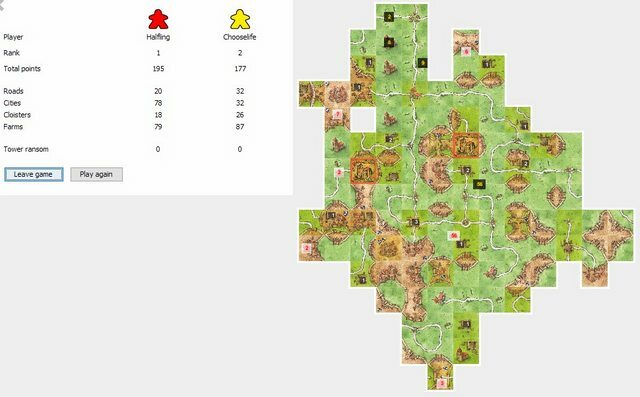 Each player is to play a single two-person game of Carcassonne using JCloisterZone against each of the other players in the division. The starting date will be 1st December 2018 and all games must be played and the results posted on this thread before midnight GMT on Friday 16th February 2019. The starting player in each case will be chosen at random. The tile set for each game will consist of the base game and each of the competitors' chosen expansions, i.e. two expansions are to be used in every match. This means that all matches have 5 points available to be distributed to the two players. A league table with points gained from matches played will be maintained and regularly posted to this thread by the tournament organiser. The top ranked two players after all matches have been played will be declared 'Champion' and 'Runner-up' respectively and will both be declared eligible for promotion. The lowest ranked two players will be eligible for relegation. After each match, it is the winner's responsibility to ensure that the result is posted to this thread clearly showing the points awarded separately for Roads, Cloisters, Cities and Farms. The full rules have been attached for you all to read at your leisure. I'm mostly available on lunch hours and a few afternoons during the week. Evenings will depend on the kids but I'm usually available after 21h00 GMT. Please just reach me on SLACK or by PM. Hi Guys! I have not fallen out with you lot, I have just put myself in the lower division to try to get things running smoothly, as most of the newbies are in that division. To that end, I would be very grateful if you could make a few pre-season friendly challenges against the guys in the Premiership (except Dan, who already has experience of the system) and in league A (except myself, obviously). Real games can commence on Saturday. I'm full on producing my pbm football magazine /game which I plan to publish on Sunday, so I am unavailable until next week. Anyone up for a game this evening? Good luck guys! I just put my money on a 2.5/2.5 draw. Don’t let me down! You've achieved the impossible Steve-o; Chooselife and I both won! I scored more points which is obviously the best thing to do. Chooselife won 3 of the individual metrics to take a 3-2 win for this league. Thanks for the game, I love both The Tower and Abbey and Mayor so this was the one I most looked forward to. Good luck in the other matches. Anyone fancy a daytime game today? If the boss take the afternoon off count me in.